Asus has selected the 5.5" form factor as the sweet spot - big enough to offer great web browsing and app usage, but compact enough to not bust out of your pocket. It surely helps that the bezels around the screen are kept fairly thin. Asus has kept the capacitive keys below the display on board, while most phones looking to remain compact with a huge screen drop them in favor of on-screen buttons. The screen has 1080p resolution and is impressively sharp at a whisker over 400ppi. You have to keep in mind this is a device that starts at $200, yet you get a sharp, IPS screen protected with Gorilla Glass 3. Asus deserves a pat on the back for this. 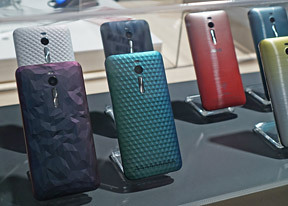 The company has borrowed some inspiration from the LG G3 here. The Asus Zenfone 2 features a button on the back, positioned in the middle, right below the camera and its dual-LED flash. Interestingly, the company decided to keep the Power button on top (it's very hard to reach the top of the tall device). The basic model will come with a brushed metal finish, which is available in a wide range of colors. More interesting are the Transfusion and Illusion series. The first breaks up the monotony with a color gradient instead of a solid color, while the latter goes even further with unique 3D patterns. Asus made a big deal of the new ZenUI, but the good news start from Android 5.0 Lollipop. The custom UI itself respects the Material design guidelines and adds important features like increased security with per-app and per-file permissions. ZenUI apps will be updated separately from the main ROM to keep them up to date, even if the major update is running late. Asus has strong ties with Intel and the Zenfone 2 is powered by an Atom Z3580 quad-core processor. The SoC also includes a PowerVR G6430 GPU (like the one in the iPhone 5s). Most impressively, this is the first smartphone to crack the 4GB RAM barrier. Of course, the $200 base model starts off with the slower chipset - Z3560 clocked at 1.8GHz instead of 2.3GHz - and you only get 2GB of RAM. Still, it sounds like a great deal, considering you're also getting 150Mbps LTE and Wi-Fi 802.11ac. For the camera, Asus picked a 13MP shooter with a fast f/2.0 aperture and software enhancements to improve low-light and HDR shots. This camera records 1080p video. On the front is a selfie-friendly 5MP camera with an 85° lens, which can be expanded to a virtual 140° with the Selfie Panorama mode. The main camera has a dual-LED true tone flash and it has manual controls. The Asus Zenfone 2 is powered by a 3,000mAh battery. It supports a fast charging tech that will bring the battery from 0-60% in 39 minutes. Asus also showed off the Zenfone 2 View Flip Cover, but the uncanny resemblance to the LG G3 and its flip cover is a bit too much.